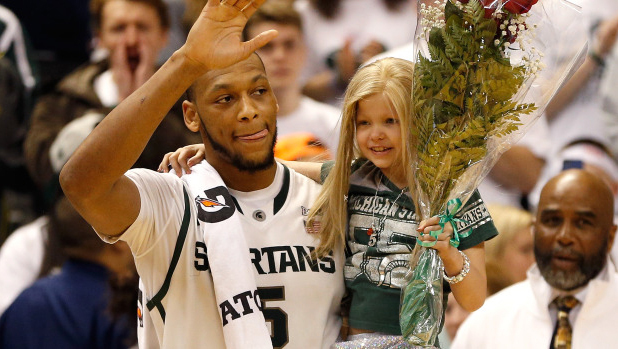 EAST LANSING , Mich. - Lacey Holsworth, the 8-year-old who battled cancer and became friends with Michigan State University basketball star Adreian Payne, has died, CBS Detroit reported. Lacey's dad, Matt Holsworth, said the girl died at their St. Johns, Mich., home late Tuesday "with her mommy and daddy holding her in their arms." The cancer-stricken girl became friends with Payne when she met him during one of her hospital stays two years ago. "They communicate and hang out like a brother and sister," Holsworth told The Associated Press last month. "It's a unique and special bond." When it was Payne's turn to be honored during the Spartans' Senior Night ceremony last month, the 6-foot-10 center scooped up Lacey and carried her around the court. "She was tired that day," Payne recalled in an interview with the AP. "I just figured I'd pick her up instead of having her walk." He scooped her up again, taking her toward the top of a ladder as Michigan State celebrated winning the Big Ten tournament by cutting down the nets in Indianapolis. He even included her in his recent shot at the college dunk contest. Lacey watched Michigan State's NCAA tournament run from the stands. After Payne scored a career-high 41 points to help Michigan State beat Delaware in one tournament game, Payne talked as much about what his performance meant to Lacey as it did to the Spartans. "It's like having a family member who's really sick," he said. "The only thing you can do is play basketball. You can't be there with them. Just knowing that when I play well, it makes her happy. It feels like I'm doing something, in a way, to make her feel better." The little girl affectionately known as "Princess Lacey," had neuroblastoma, a fetal-nerve cell cancer. She wore a long, blond wig because chemotherapy took her hair. Back pain while dancing in 2011 led to the discovery of a football-sized tumor that had engulfed her kidney. After another tumor wrapped around her spine, her father had to carry her into a hospital on Dec. 28, 2011. She lost feeling below her belly button and couldn't walk on her own for several months, a long stretch that included the first of many visits from Payne. While Lacey had some victories in her battle, the cancer kept coming back and eventually spread to her neck, head and pelvic region. "She loved unconditionally and without hesitation," Holsworth said. "Spreading her smile and love throughout the world."